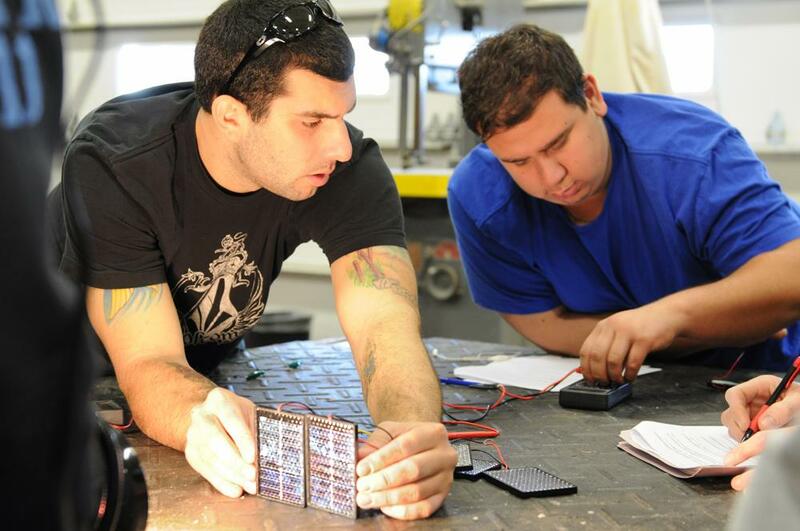 Tim Governale, left, a SUNY Oswego senior technology education major, holds a photovoltaic cell -- used to convert light energy to electricity -- while Steve Badaracco, a junior technology education major, measures energy output Nov. 4 in Tom Kubicki's class in energy technology. The course is one of 14 that students may apply toward the electives requirement for a new 21-credit-hour minor in sustainability studies. OSWEGO — A new minor degree program at SUNY Oswego aims to provide students with knowledge and experience in environmental issues and the growing job market related to sustainability. The recently approved minor in sustainability studies requires 21 credit hours of study in a wide variety of courses that engage ideas, projects and policies for better environmental stewardship. The minor’s requirements include core courses in geology and in economics/political science; a choice among biology, anthropology and physics classes; and electives in biology, chemistry, economics, geology, meteorology, political science, psychology and technology. Tom Kubicki’s class in energy technology recently worked outside with photovoltaic cells, measuring energy output using homemade devices called insolometers. Modules of such cells make up commercial solar panels. Sustainability is a common thread running through all technology courses, he said, not just this one, an elective in the new minor. Kubicki said students with sustainability minor would move on to be productive citizens, to vote and to carry on the concepts learned at Oswego, with the help of real, contextual, hands-on work on projects such as the ones his class does. Venera Jouraeva, visiting assistant professor of chemistry, loves teaching environmental science, an elective in the new minor. The minor provides academic support for the vision behind the American College and University Presidents’ Climate Commitment, which SUNY Oswego President Deborah F. Stanley signed in June 2007, and for sustainability efforts that gained new momentum on campus this summer with submission of the college’s first STARS (Sustainability Tracking, Assessment and Rating System) report. Casey Raymond, co-chair of the Presidents’ Climate Commitment and Environmental Sustainability Team, said SUNY Oswego’s STARS rating shows the college is doing “pretty well,” but a new minor in sustainability studies helps the forward momentum.